This time of the year, in the early fall is a prime-time to take care of your lawn. 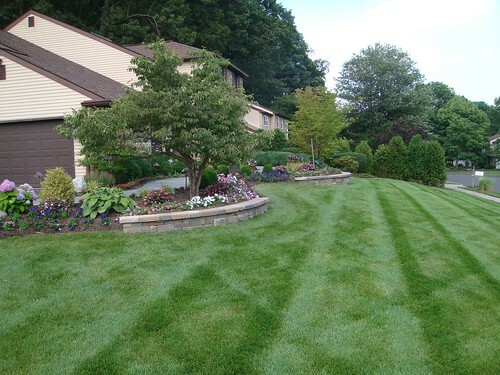 There are many opportunities to help your lawn at the present time and for the future. Aeration – Now is the perfect time to aerate your lawn, digging holes 2-2.5 inches deep for depth will insure that fertilizer and seed can get a head start. Make sure to watch your spacing too. Holes should be about 3-5 inches a part. Seeding – This is a big step for me each year. During the first part of September, I try and put down some fresh seed. Having a thick lawn helps me combat issues with crab grass and clover leaf. Make sure you watch what type of seed your are purchasing. Some people prefer thick-leaved grass and others like the thin blade grass. It really comes down to your preference. With cooler fall temperatures and some additional watering, you will be able to see the new grass blades in a matter of a couple of weeks. I like to seed on Labor Day Weekend and follow it up with a fall fertilizer application at the end of September. Soil Testing – Now is the perfect time to check the nutrients in your soil. For more information, check out the Midwest Laboratories Lawn and Garden site. A soil test report is a place to start to determine the amount of nutrients in the soil and to help you understand what type of fertilizer would be most beneficial to your soil. With your soil test report, you will be furnished an access code which you can use in conjunction with the online fertilizer application calculator to determine how much fertilizer to apply on your lawn. Purchase sod – If you have some problem areas and you have addressed them by testing the soil, purchasing sod is another option for these areas. In addition, if you have a spot or two where the grubs ate up the lawn, you may want to put down some 24 hour grub killer and lay sod over the top of the area. If you do purchase sod, make sure you water it aggressively for a couple of weeks. The sod will need a little time to get its grass roots into the soil and watering aggressively is recommended. I would not recommend trying to kill crabgrass with some type of herbicide. Winter is just around the corner and weeds will die with the winter freeze. The best we to combat crabgrass is with a pre emergent in the spring not a post emergent in the fall. The best way to get rid of them is to remove them by digging the out and adding more seed in these areas. Nutedge – When you apply water, you may still see this yellowish grass-like weed, my advice leave it alone. You will do more damage trying to apply a herbicide and it may in some cases not kill all of it. Add more seed and try to create a thicker lawn in these areas. Don’t aerate when it is extremely wet, this could have an adverse effect by hardening the ground. Don’t purchase sod and only water it once a week. It will not last long at all. Sod takes a lot of water in the fall to establish root development. If you know of a tip that would benefit others during this September time frame, I would invite you to leave a comment and let me know. Good luck with your lawn in September, it is the best time of the year to make a difference.